Dr Katia B. Pagnano from Brazil presented their multicenter, observational study on the efficacy and safety of generic imatinib compared to Glivec. 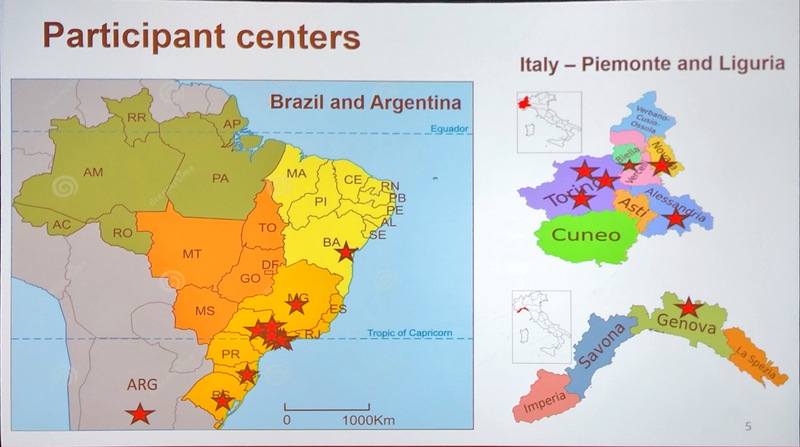 The prospective cohort enrolled 160 patients from Brazil, Italy and Argentina who initiated treatment with generic imatinib between January 2015 and September 2017. This group was compared retrospectively with a cohort of 285 patients that were treated with Glivec between January 2010 and December 2011, so approximately five years earlier. The patients on generic imatinib were on average younger (50 vs 55 years), had a higher proportion of high-risk patients (26% vs 15% on Sokal score), and had a longer time from diagnosis to start of treatment than the Glivec patients. Also, because the patients on generic were treated five years later after the new ELN recommendations were published in 2013, the Glivec cohort was managed according to the 2009 ERN criteria and the Generics cohort according to the 2013 ELN criteria for e.g. suboptimal response, so there was a difference in clinical practice to switch to 2nd generation TKI in case of suboptimal response, which makes the groups harder to compare. All patients started imatinib in chronic phase, less than six months from diagnosis. Patients were managed according to European Leukemia Net (ELN) 2009 and 2013 recommendations. The definition of responses followed the ELN 2013 criteria. However, the generic cohort was treated later by ELN 2013 milestones and hence were switched earlier to 2nd generation TKI in case of suboptimal response. Adverse events were assessed based on the common terminology criteria for adverse events. There was no difference in toxicity between the Glivec and generic patient cohorts. The rate of treatment failure at 3 months according to the ELN 2013 criteria was 7% and 16% in Glivec vs. generic; whereas at 6 months there were no significant differences (12% vs. 15%). Disease progression rates were similar (1% on Glivec vs. 1.8% on generic imatinib). Overall 2-year survival was 99% on Glivec and 94% on generic imatinib. Overall, there were no statistically significant differences in overall survival and progression-free survival in the low risk groups on both treatments, and an inferior event-free survival in the generics group. Comment: Overall, the data is difficult to interpret, given this is not a randomized study but a comparison with historical data where management of patients was based on different versions of the CML treatment guidelines and availability of 2nd generation TKI. At ASH, a participant raised the question which generics were used, but the data on this is not yet available. All in all, the data demonstrates that overall survival on the generic is at 94%, which is slightly worse than on the original drug, but this may be due to technical reasons (different patient management according to ELN criteria; a higher proportion of high-risk patient in the generic cohort). See the slides of the presentation here. 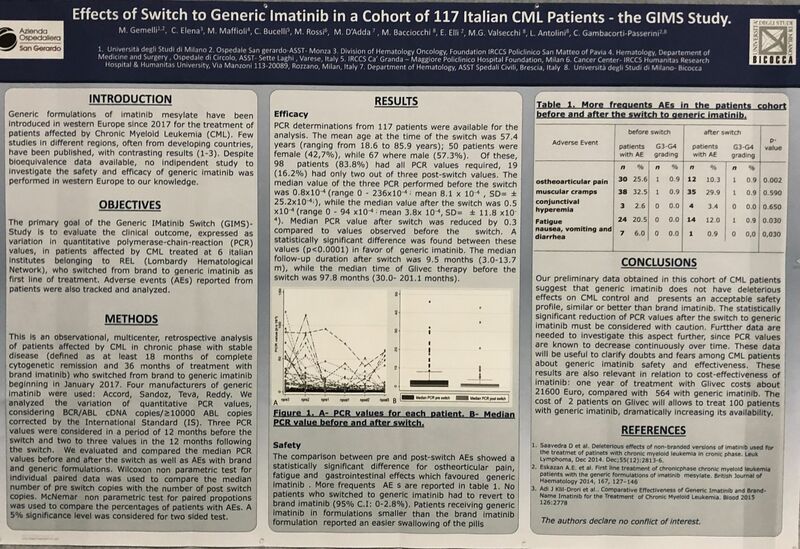 Dr Maria Gemelli from Italy reported about the Generic IMatinib Switch (GIMS) Study which evaluates the clinical outcome in patients affected by CML treated at 5 Italian institutions belonging to REL (Lombardy Hematological Network), who switched from brand to generic imatinib as the first line of treatment. Adverse events (AEs) reported from patients were also tracked and analyzed. In this observational, multicenter, retrospective analysis of patients affected by CML in chronic phase with stable disease (defined as at least 18 months of complete cytogenetic remission and 36 months of treatment with brand imatinib) who switched from brand to generic imatinib beginning in January 2017. Four manufacturers of generic imatinib were used: Accord, Reddy, Sandoz and Teva. The authors analyzed the variation of quantitative PCR by the International Standard (IS). Three PCRs were considered in a period of 12 months before the switch and 2-3 PCRs in the 12 months following the switch. Data from 109 patients were available for the analysis. The median duration of imatinib treatment was 9.1 years (range 4.5-18.3 years). The mean age at the time of the switch was 57 years (range 18-85 years); 46 patients were female (42%), while 63 were male (58%). Of these patients, 94 patients (86.2%) had all required PCR tests required, 15 (13.8%) had only two out of three post-switch tests. The comparison between pre and post-switch adverse events showed a statistically significant difference in favor of generic imatinib for most of them, with the exception of muscular cramps and conjunctival hyperemia. No patient switched to generic imatinib had to revert to brand imatinib. Patients receiving generic imatinib in formulations smaller than the brand imatinib formulation reported an easier swallowing of the pills. The preliminary data obtained in this cohort of CML patients suggest that generic imatinib does not have deleterious effects on CML control and presents an acceptable safety profile, similar or better than brand imatinib. The statistically significant reduction in BCR-ABL after the switch to generic imatinib must be considered with caution and further data are required to investigate this aspect since PCR values are known to decrease continuously over time. These data will be useful to clarify doubts and fears among CML patients about generic imatinib safety and effectiveness. See this ASH poster in higher resolution here. To download the report as a pdf file, please, click HERE.